Tonight on FOX AMERICAN IDOL returns with a new episode and we now have our Top 20 semi-finalists. On tonight’s show the 10 ten ladies perform. Did you watch last week’s episode where the 20 semi-finalists were chosen? We did and we recapped it here for you. The Top 20 are: Girls – Janelle Arthur, Aubrey Cleland, Candice Glover, Kree Harrison, Amber Holcomb, Zoanette Johnson, Adriana Latonio, Angela Miller, Breanna Steer and Tenna Torres; Guys – Charlie Askew, Curtis Finch, Jr., Paul Jolley, Elijah Liu, Devin Velez, Lazaro Arbos, Nick Boddington, Vincent Powell, Cortez Shaw and Burnell Taylor. On tonight’s show which will be aired live from Las Vegas the Top 10 girl semifinalists take the stage and sing their hearts out for America and the judges in hopes of winning America’s vote. This week we will have 3 episodes of American Idol, tomorrow it is the Top 10 guy semifinalists’ turn to perform and on Wednesday this season’s finalists will be announced live. The show airs tonight at 8PM and it is sure to be an episode you do not want to miss. Make sure to come back Tuesday and Wednesday night to see the rest of the action. 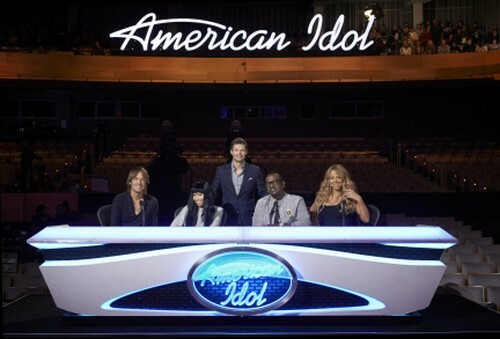 AMERICAN IDOL TOP TEN GIRLS PERFORM LIVE RECAP HERE!